Sweeping southwards from Göcek to Fethiye on the south coast of Turkey, the calm waters of the Gulf of Göcek are backed with spectacular forested hills. Its crenellated coastline is indented with sandy beaches and dotted with fishing villages and exclusive marinas as well as the remnants of earlier Roman and Lycian civilizations. The charming town of Göcek itself was once a fishing village and it has retained its old-world ambience, with pretty streets and exclusive restaurants as well as a smart marina stuffed full of sleek yachts. Further south along the gulf, the modern tourist destination of Fethiye offers up colorful fish markets and stylish stores as well as history fixes in its Roman ruins and tumbledown Crusader towers. The Gulf of Göcek offers some of the best sailing in the Mediterranean: calm water, shelter from extreme weather conditions and plenty of fine, white-sand beaches to discover. Offshore lies an archipelago of idyllic, sleepy islands, all with sheltered bays and pocket-sized coves providing safe anchorages; most moorings also have waterside tavernas serving simple dishes such as mezze and grilled fish plucked straight from the sea. Traditional Turkish wooden boats known as gülets ply the waters of the bay, offering options from day trips to week-long cruises among the islands. The Gulf of Göcek is 100 km (60 miles) long, a sweeping bay taking a massive bite out of the south coast of Turkey. The town of Göcek is just 20 minutes’ drive from Dalaman airport, while Fethiye at the southern end of the gulf is accessible in just over an hour. 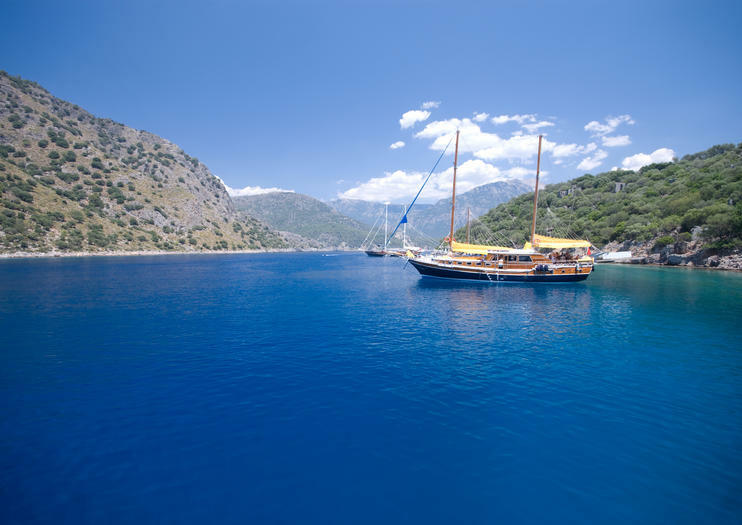 Water-taxis from Göcek and Fethiye harbors make the sea trip out to the islands daily.